The Minecraft code can be divided into two “sides” – Client and Server. The Server side is responsible for maintaining the master copy of the world - updating the blocks and entities based on packets received from the client, and sending updated information to all the clients. The Client side is primarily responsible for reading input from the player and for rendering the screen. There is one server, and a number of clients which connect to it. Even in single player mode, the server and client code are running simultaneously (in separate threads). Some parts of the code are used by both Client and Server code, for example Block methods. If you are writing code which might be called by either Client or Server, how can you tell which side has called the code? if World.isRemote is false, this is Server side. NetHandler.isServerHandler() returns true if Server side. FMLcommonHandler.instance().getEffectiveSide() returns Side.SERVER or Side.CLIENT. Some guidelines on the Client<-->Server communication here. 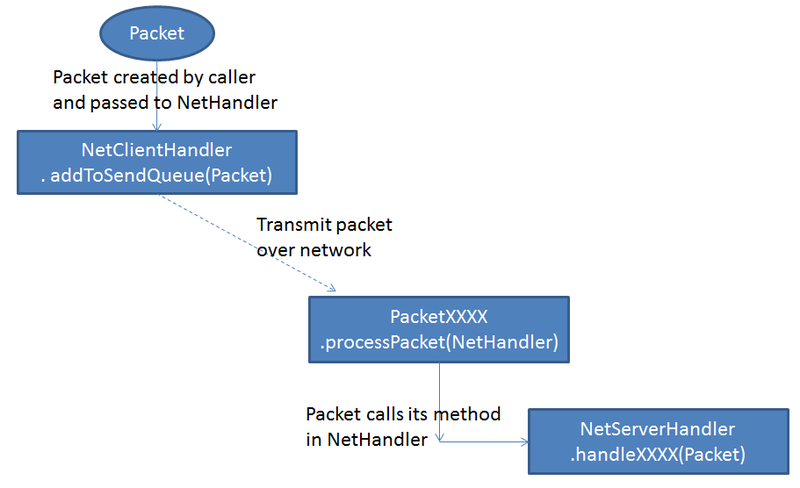 If you need to send packets in your mod code, Forge has thoughtfully provided PacketDispatcher to send packets to the client or the server without having to retrieve a NetServerHandler or NetClientHandler. If the existing packets don’t meet your needs, you can create a custom packet Packet250CustomPayload. More details here. Creation, Removal, Movement, health, actions etc for Entities. 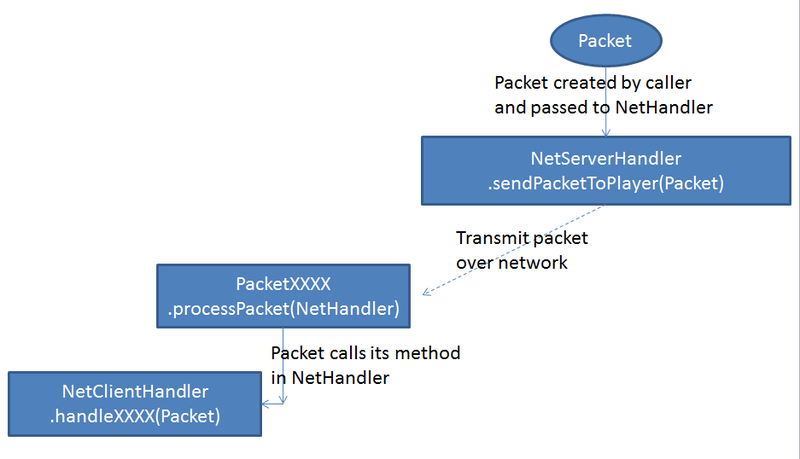 This is accomplished for new Entities by Forge packet EntitySpawnPacket. You can define a custom handler for this using EntityRegistration.setCustomSpawning().